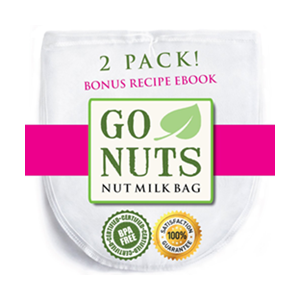 What is a nut milk bag? 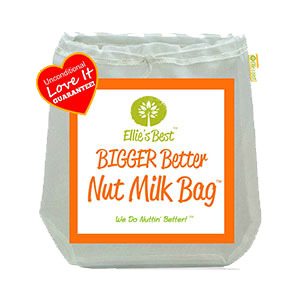 It is a bag that makes preparing homemade nut milk a breeze! 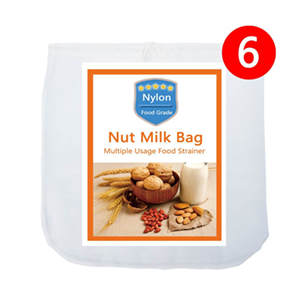 Basically, the bag has tiny mesh fibers that strain out any nut pulp you don't want in your milk. This makes any nut milk recipe super easy. 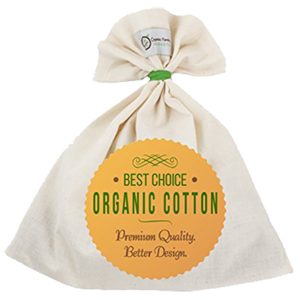 All you do is squeeze out your milk, the rest is left in the bag, which you can later re-use in crackers or other raw vegan recipes. It's kinda of like the modern day version of milking a cow and we'll show you below how you can use it for other things not just nut milks. Many people today are switching over to nut milks as an alternative to cow, soy and rice milk. Today when you ask someone if they "got milk? ", it has a whole new meaning, no animals involved, just nuts from trees! There are some boxed brands out there selling a variety of almond and hemp milks, but there is nothing quite like making your own from scratch using organic, raw nuts and seeds. That way you can make your milk from any seed or nut varieties you like, for instance: hemp seed, brazil nut, pumpkin seed or even pistachio! 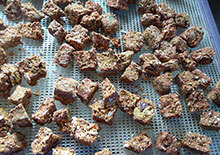 We list a few nut milk recipes using herbal tea alchemy as a base. But many people love just basic nut milk, drinking it ice cold by the glass or with raw granola. In the last year I have noticed more health food stores in California are carrying raw food products, superfoods and kombucha brands. Along with this has come a number of products that make this healthier lifestyle more accessible. 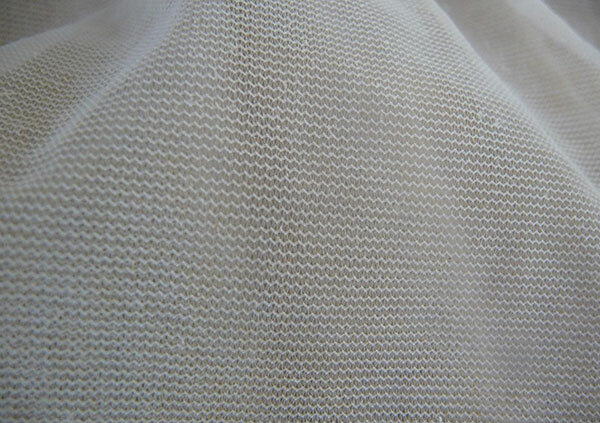 1) Has fine nylon or cotton mesh to extract every bit of possible milk from your nut blend. 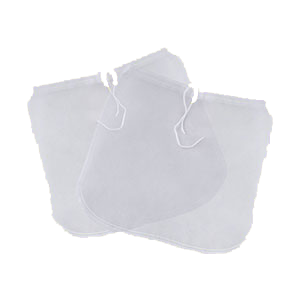 2) The size of the bags can strain a lot of milk at one time. 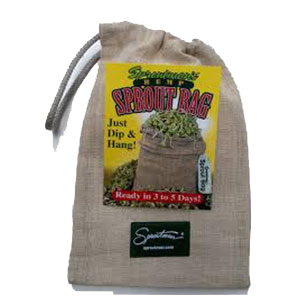 This is great if you are making bulk quantity. 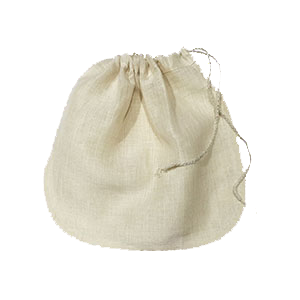 3) Has a drawstring to pull the bag close, so you can squeeze out the milk effectively. 4) Takes only a minute to pour in your blended nut milk cream and squeeze a few times with your hands to strain, no pressing involved. 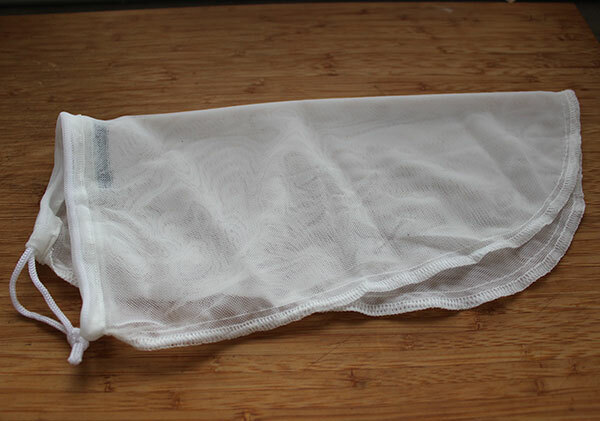 5) Milk bags are great because they take the fiber out of your milk. This makes it silky and creamy. 6) Can fit around the edges of most any bowl with the drawstring pulled tight, allowing you to pour in the nut mixture. 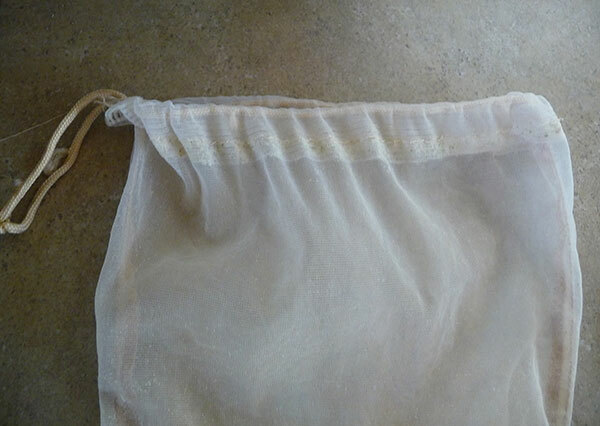 7) Nut milk bags also work to sprout super sprouts strain vegetable pulp to make fresh super juices. 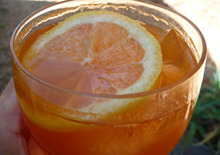 We show you how on our green juicing on the road page. 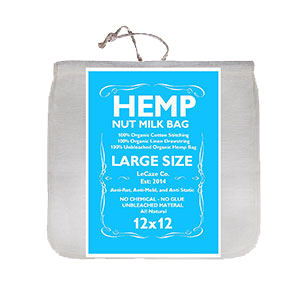 8) The biggest reason to get a nut milk bag is that they are so affordable and, best of all, reusable! 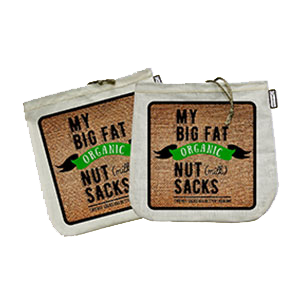 You can now pretty much find re-usable nut milk bags hanging right near the register of a health store or on the end caps of isles. They are usually about 10 bucks and well worth the few amount of dollars you will spend. 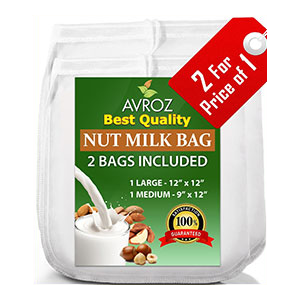 They make the process of straining your fresh, homemade milk, using any kind of nut, a fun experience, rather than a tedious, time consuming one. Many people are making the switch over to this non dairy milk alternative. It takes amazing, and it is easy to make!